What Does an SCRA Search Really Cost? HOME > Blog > General > What Does an SCRA Search Really Cost? Everyone wants the best product for the lowest price — it’s only human nature. The difficult part is figuring out if the price you’re paying is worth the product you’re getting. Which begs the question, what does an SCRA search really cost? When you need to litigate against a tenant, a borrower who has defaulted on a mortgage or car loan, or any debtor who may owe you money, you must comply with the Servicemembers Civil Relief Act. This law provides protections to active duty members of the military. So before you start any proceedings against these individuals, you must find out first if they are members of the military. But how do you do this? As any resident of the United States knows, the government is a convoluted, complex labyrinth of rules and regulations. If you are lucky enough to find the information you are looking for online but you need further help or clarification, you are unlikely to get it in a reasonable period of time, if at all. Or, you could face the frustration when the DMDC gives you a result that the court will reject — because you didn’t have the social security number. Handing the search over to someone like the Servicemembers Civil Relief Act Centralized Verification Service (SCRACVS) relieves you of the burden of sifting through reams of useless information, looking for the one piece you need. When you use the SCRACVS, all you have to do is supply us with the name of your target individual. The Social Security number is helpful, but not necessary. We can get this information for you at no extra charge, as long as you can provide information like the person’s address, phone number or relatives’ names. Think about how much time you would need to spend online searching through databases on your own for the verification you need — even if you had the SSN. An hour? Two? More? And what if you spent hours searching and never even found the correct answers? Lots can go wrong. Sometimes a Social Security number is incorrect. People may use a different name than the one associated with their SSN. Sometimes two people have the same name. The margin of error is high. Another time-waster is writing to each branch of the military separately in an attempt to obtain verification. You can sometimes wait months for replies, if you get any at all. Plus, each military branch charges a fee of $5.20 to complete the verification. Our service guarantees we will supply you with the information you need within 24 hours for $36.40. Our fee equals what it would cost you to write to each military branch, except you get guaranteed answers overnight. No chasing after hard-to-find data, no frustrating hours spent online getting nowhere, no hassles at all — just give us the name and we give you answers. If we can’t, you’ll get a complete refund, or you can order an affidavit of due diligence. Plus, we can also supply you with an affidavit to take to court with you for only $20 extra. The DMDC will not provide that. Some specifically include disclaimers saying they cannot be held responsible for the accuracy for their response if you didn’t supply the Social Security number! You could get to court and see your case postponed or dismissed due to erroneous or insufficient information! The time you will have wasted performing the search yourself, going to court, getting nowhere and finding yourself back at square one is worth more than $36.40. If you represent a large organization that needs to perform batch searches, you can save even more money. The SCRACVS can perform large-volume searches quickly, and at a discount. We also provide live support via phone or chat if you have any questions about your search or the process. Try getting that kind of service from the government! 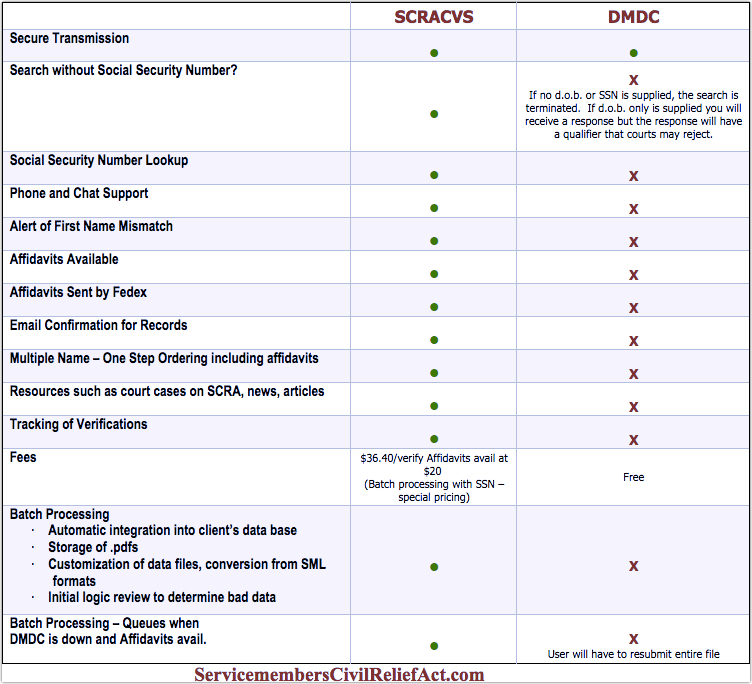 The only way to be sure you have the right information for the right person is to go through a provider, like the SCRACVS. We stand behind every search, and we guarantee 100% satisfaction or your money back – no questions. Click here to get started with your search today, and have answers in your inbox tomorrow.